An Oklahoma State Representative wants to impose a tax on violent videogames to help fight childhood obesity and bullying. 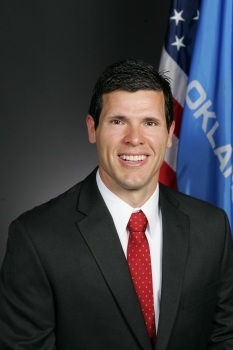 Oklahoma State Representative William Fourkiller is a man with a plan. Beginning with the presumption that violent videogames make kids fat, lazy and mean, he's proposed a tax of one percent, above and beyond any existing sales taxes, on such games to fight the problems of childhood obesity and schoolyard bullying. Half of the taxes collected will go to a "Childhood Outdoor Education Revolving Fund" and half will go to a "Bullying Prevention Revolving Fund," both of which would be created under the terms of the new law. As for what constitutes a "violent" videogame, the bill proposes that the term be applied to any game that has been rated by the ESRB as Teen, Mature or Adult Only. The final section of the bill also rather bizarrely declares the situation an emergency, "it being immediately necessary for the preservation of the public peace, health and safety," and thus states that the law "shall take effect and be in full force from and after its passage and approval." The bill - HB 2696, for those who want to check it out in full - is slated to come into effect, pending passage, on July 1. Whether or not it gets that far is an open question, however; a nearly identical law proposed in New Mexico in 2008 failed to make it through the state legislature.